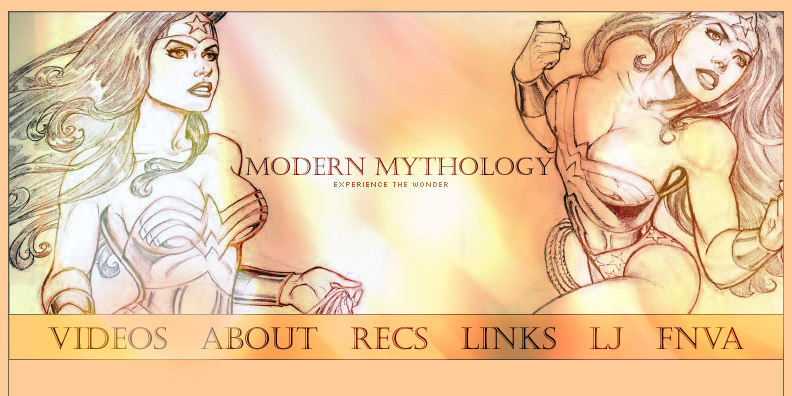 Send an email to dragonchic@modern-mythology.com or comment on my LJ. What's with the site title? The mythology of ancient times has always fascinated me, and I consider superheroes to be the modern-day equivalent. At the time I created this site, I was almost exclusively vidding superhero fandoms, so it seemed appropriate. Why are so many of your vids about superheroes? Obsess much? How long have you been vidding? I've been making videos since late 2005 but I had edited short films (and I use the term loosely) and documentaries before that. What do you use to edit these videos? I started out on Adobe Premiere Pro 1.5 and upgraded to Premiere CS4 in 2010. I had some very informal training in Final Cut Pro which I carried over to figure out Premiere. However, I firmly believe that anyone can figure out how to effectively use whatever program they have at their disposal. My suggestion to new editors would be to work at a slow pace, giving yourself enough time to really look over you vid with a critical eye. In most cases, you won't be pressed for time, so there's nothing stopping you from spending the neccessary time to familiarize yourself with your editing software and experiment with different editing techniques. Can I use some clips from your videos in some of mine? This is a big fat NO! Even clips that appear to be stretches of uneditted footage in my vids have often been cut to better fit the music. Can you host my videos and/or website? At the moment hosting is by invitation only. Can I link to this site/Can we be affiliates?